Kevin Trudeau is fast becoming one of the nation's foremost consumer advocates, adopting, as both his personal and professional mission statement, a vow to "positively impact the whole person." 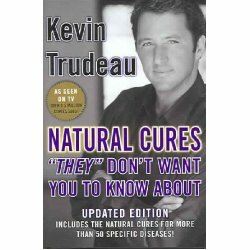 In his revolutionary new book, Natural Cures "They" Don't Want You To Know About, Kevin Trudeau discusses what he calls the "nest of deception and double standard concerning general and individual health" and his beliefs that information about natural remedies and natural cures are being suppressed by pharmaceutical companies and various federal agencies. With your help we can reach more people and let them know about Natural Cures by Kevin Trudeau whether this product works or not. I bought this book and basically it says to eat healthfully and use only natural stuff for your ailments. I thought that there was going to be much more information, but the book just kept repeating what he said in the infomercials... He was redundant and after a few chapters of telling the reader that he was being hushed by government agencies for his findings , he still didn't say what the cures were. It was basically a book a drunk would write, where they have one point and repeat it over and over again in as many different ways as possible! Don't buy it! Go to a book store and pop it open. You will see what I mean!!! I liked this book. Very informational. Lots of information on all types of issues. I don't know about you but with all the side effects of perscription medication, natural is a much better way to go. I have not tried everything in this book only a few and it does work. I reccommend using Apple Cider Vinegar. You should research everything it can do for you.